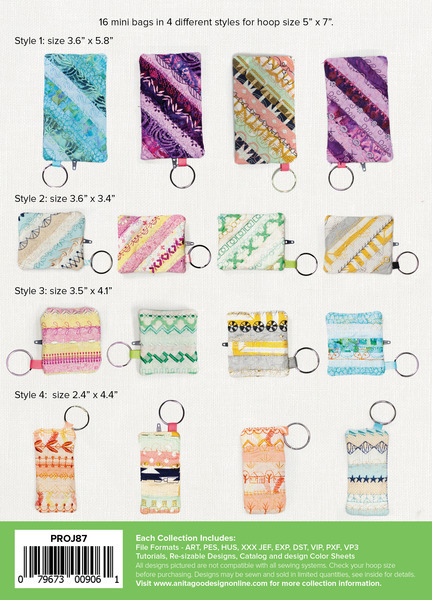 16 Different mini bags in 4 different styles for hoop size 5 x 7". There are 16 different keychain bags in this collection, which come in 4 different styles. Make one for yourself, and then make one for a friend! 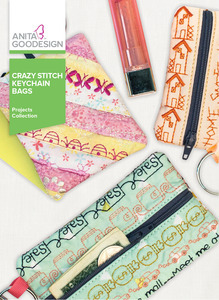 The themes of our keychain bags vary from music, to shopping, to springtime! You can pick your own fabrics to give it your personal touch. Surely you will find one that suits your style! These bags can be used for spare keys, money, credit cards, cosmetics, candy, or anything else that seems to always get lost in your purse!